The ECO Level 1 is made up of four subjects. Each subject has the same study and examination commitment. The course instruction builds upon previous knowledge so it is best to complete the subjects in order. For the ECO Level 1 certification, all subjects ECO 1 – 4 need to be completed and satisfactorily passed. Please see ECO Fees for discounts for a group purchase. The ECO subject 1 tutorials form the building block for later subjects within the course. Subject 1 offers an overview of anatomy, physics, transthoracic and transesophageal echocardiography as well as artefact generation. 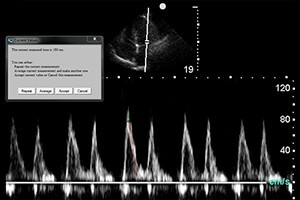 The ECO subject 2 outlines the technique of using ultrasound to guide percutaneous procedures. Procedures will include vessel access, nerve blocks, and trauma related procedures. The ECO subject 3 introduces Doppler Echocardiography to complement basic transthoracic echocardiography imaging. The ECO subject 4 expands the knowledge of transthoracic echocardiography by learning pathophysiology and assessment of ventricular function, including in diastolic function.